These magical forests, declared natural park in the nineties, are the result of the equilibrium between the natural evolution and the mainteinance of the ground’s characteristics, the climate and orientation. They form the largest and most representative atlantic forest and they inspired “El bosque animado” by Wenceslao Fernández Florez. 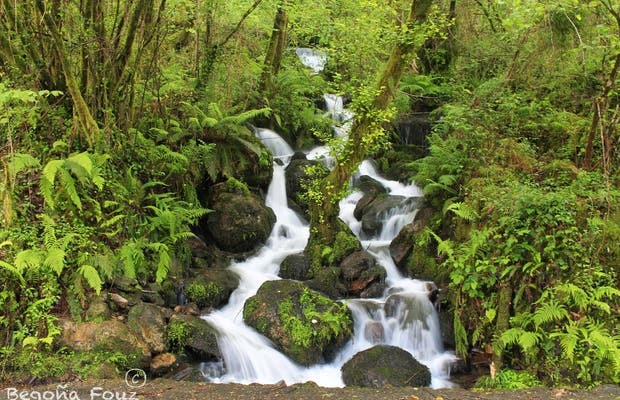 The Eume River, that has its source in the Serra do Xistral (Lugo) in the backbone of the park. The guides explained to us that, a long time ago, Galicia used to be covered by “fragas”. They are mixed forests, mainly with oak trees, but where you can also find maple trees, birch trees and holly trees. Its main threat is the eucalyptus tree plantations, which slowly displace the fragas. It is a place to get lost in its beauty. Beautiful landscapes and beautiful and magical corners surround this park, no matter which way you look, it will surprise you. The Fragas (forests) have various interesting points. I recommend you to visit them. The Fragas do Eume are beautiful both on the side of Pontedeume and the side of Montefero, and on this last one they acquire more natural value since they are not “visited” by humans. Its flora and fauna along with magnificent views make the place worth visiting, always respecting the surroundings. It is a natural enclave with an unusual beauty located on a privileged area on the northern part of A Coruña. It is a forest with pedunculate oak, downy birch, sweet chestnut, black alder, willow, and European ash trees among other autochthonous species. It has numerous areas for hiking, where sport junkies can have amazing experiences as well as photographers, since the place is so beautiful. Since I was a little girl I have visited this forest. Every time I go it is a spectacle, since with each station the colors are different, the light goes in through the ferns and filters the rays over the river in the summer. In winter, a fog hangs over the surface of the river, giving it a ghostly appearance. You have to see it. During the summer there is a bus service, but you have to book in advance. You can also get there, rent a bike and do the route without any problems.